There was a big earthquake at 12.50pm yesterday. Immediately many people (public) started gathering in our premises (Dillibazar centre) and crying for safety. The noise and fear was very impressive. They were about hundred persons. Some come with car, bikes. Also some sick people, old people and a woman who just give birth. They seemed very terrified and scared and our team did his best to support them. We served food, snacks, water to all and managed our securities to filter people at the gate. We also tried to contact all staffs and the different team (rescue team) dispatched around the country. We also managed to collect additional rolls of mattresses and launched our evening field service to support street-based kids or lost kids. In Dillibazar, we fixed the tents (Belgian Army tent) and managed beds and blankets for all people in need. On around 100 persons in Dillibazar (plus CPCS Kids), around 20 were seriously sick and needed urgent treatment. In the field (street work), we found people crying for help and scared security forces, especially around Nakhu area where a full nursing home collapsed. We went also in Balaju area where many buildings collapse. About Dolakha and Sindhupalchowk, very difficult to contact the team, apparently many persons are hurt or death and the road is blocked by a huge landslide. In Charikot and Dolakha, maximum 5% of the homes remain. 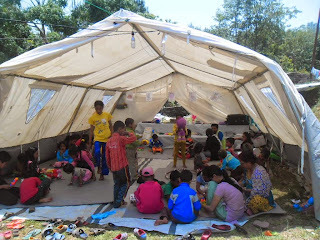 Very difficult to plan for our camp for displaced kids there. At Dillibazar, during the night, we tried to give food to all, but in priority to kids, elderly, sick persons and handicapped. It's very complicate to control the public but many of them are kind and friendly. Gunja Lama, our youth paralysed and at the hopital was evacuated in open space and a ward doctor is watching him. Internet and phone, not working properly.